The ASAE CAE preparation guide featuring 100 exam questions This is the ASAE test prep resource for the CAE exam, which leads to certification as an association executive. The ASAE CAE Study Guide (2015): Preparation Reference for the Certified Association Executive Exam + Practice Test Bank is the only book with a practice exam based on actual questions released from the official CAE item bank. This edition reflects newly updated and revised job analysis study findings from the American Society of Association Executives (ASAE). In this book, you ll find everything you need to feel confident on test day, including high-level summaries of all the content covered in the CAE content outline s nine domains. In addition to easy-to-digest content sections, CAE Study Guide (2015) is full of indispensable resources for anyone preparing for CAE certification. The online practice exam includes 100 questions released from the official CAE exam database, and testing tips will orient you toward the most successful strategies. * Comprehensive content summaries of all nine domains tested on the CAE exam * Online practice exam consisting of 100 questions drawn from the CAE test item database, plus answer key * Preparation resources including recommended reading, key definitions, self-assessment, CAE study questions, and more * Exam day readiness tips and suggestions for creating a study plan, focusing on difficult areas, and reducing test anxiety Beginning with the May 2015 CAE exam, the CAE Commission will implement its revised CAE test based on the updated content structure. 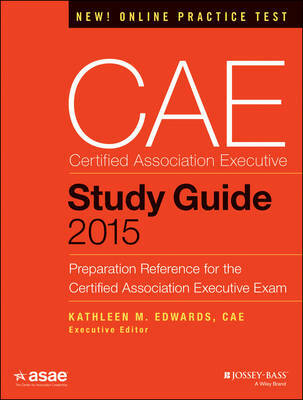 CAE Study Guide (2015) is a terrifically useful resource for anyone seeking CAE certification.